The CooKoo Bird is a small, blue bird that is a friend of Mario and Luigi on The Super Mario Bros. Super Show!, who lives inside their wall in Mario Brothers Plumbing. The CooKoo Bird rarely appears, and when he does, it's only momentarily, usually to announce the time, alert Mario and Luigi about incoming subway trains from the nearby station, or to just drop the occasional comment. 1 History in The Super Mario Bros. Super Show! History in The Super Mario Bros. Super Show! In "Toupee", the CooKoo Bird appears to warn Mario and Luigi about the incoming subway train, which just so happens to be carrying Inspector Klean, who is on his way over to evaluate Mario Brothers Plumbing, and see if the place is up to code. In "No Way to Treat a Queenie", Mario assumes that Luigi has gone cuckoo due to the fact that he is speaking with a British accent. This angers the CooKoo Bird, who pops out of the wall, demanding to be left out of their conversation. At a later point, Mario and Luigi both start speaking with British accents, until the CooKoo Bird returns, yelling at them to stop. In "Pizza Crush", the CooKoo bird sometimes announces Jodie's arrival when she enters the basement, describing her as a "babe". At one point, when Jodie announces that she would return before leaving, the CooKoo Bird openly wishes that he were a plumber. 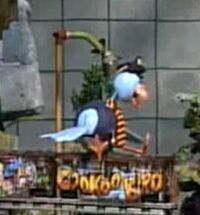 In "French", while Mario is looking for Luigi through the periscope, the CooKoo Bird suggests for him to search in France, as he had been practicing his French skills earlier on. He later appears after Luigi comes back with his new girlfriend, and hints to Mario that he should learn French for himself to get a beautiful girlfriend like Luigi's. In "Santa Claus Is Coming to Flatbush", the CooKoo Bird appears to announce the midnight hour on Christmas Eve, indicating that it is now officially Christmas Day, and wishes Mario, Luigi and Nick a Merry Christmas. This page was last edited on September 21, 2018, at 16:15.